"This is a journey into Never Neverland"
Touching the sun sounds like an insane dream. But in a feat of engineering that fulfills a recommendation made 60 years ago to launch a probe to our local star, NASA’s Parker Solar Probe shows that dreams really do come true. 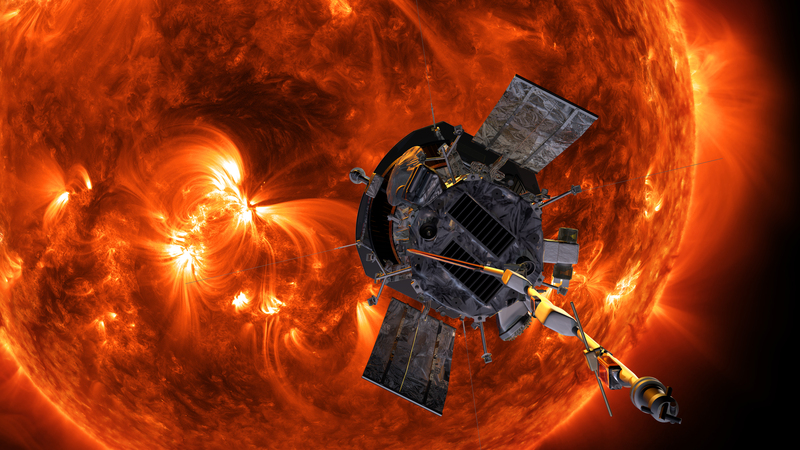 Built by the Johns Hopkins Applied Physics Laboratory, the probe launched in August broke two records on Monday: first, setting the shortest distance a spacecraft has ever flown relative to the sun, and second, hitting speeds higher than any spacecraft in history. The Parker Solar Probe was a mere 26.55 million miles (42.7 million kilometers) away as it reached the closest point of orbit relative to the sun — called the perihelion — at 10:28 p.m. Eastern on Monday night, hurtling by at an unprecedented 213,200 miles per hour while collecting scientific data. But this record is only the first of many the probe will break, as project manager Andrew Driesman from Johns Hopkins APL explains in a video released with the news. On this first encounter, the car-sized probe passed within 26.55 million miles of the sun’s surface, which is already comparable to the previous record set by Helios 2 in 1976 at just under 27 million miles away. Over the next seven years, the probe will use Venus’ gravity to nudge itself on closer and closer loops. It’s slated to dip 3.8 million miles away from the surface by the end of the mission in 2025. Parker Solar Probe's current location. The red lines indicate future trajectories that get progressively closer to the sun, as nudged along by Venus flybys. But in the hellish temperatures and harsh radiation, scientists are looking forward to studying the sun’s magnetic fields, plasma, and energetic particles. Getting this close to the sun puts the Parker Solar Probe squarely in the sun’s corona, the atmosphere around the sun that reaches 2,500 degrees Fahrenheit (or 1,377 degrees Celsius), exceeding the temperature of the surface itself. To beat the heat, the spacecraft will protect its sun-facing side with a heat shield called the Thermal Protection System. Its low-creativity name belies how hefty this component of the probe is. The 160-pound shield, a 4.5-inch-thick foam core set between superheated carbon composite, has such a high heat capacity that it can withstand 820 degrees Fahrenheit while keeping the instruments tucked behind it safely at room temperature. 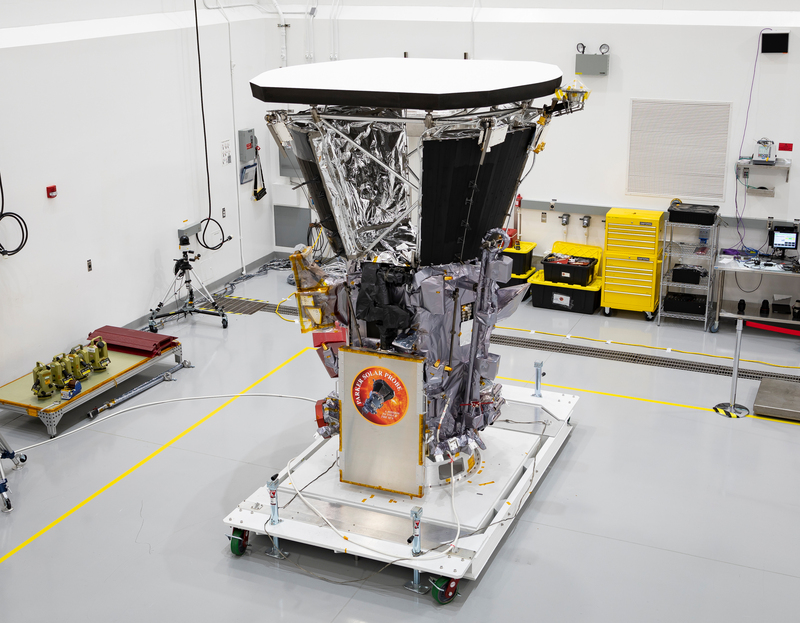 The Parker Solar Probe, with heat shield installed. Even with the Thermal Protection System, the heat forces researchers to keep communications simple. Out of four different beacon tones, one confirms that everything is fine, while the other three indicate different types of issues. During the days around perihelion though, the sun’s radio emissions will cut out communications until the spacecraft can reply with a beep. “We will be mostly out of contact with the spacecraft through encounter, so the only thing we will have is those beacon tones,” says Sanae Kubota, the fault management lead. Using the data — which takes about 30 minutes to transmit between the probe and Earth — scientists seek a better understanding of space weather, such as solar winds. Although the sun is 92.96 million miles away, space weather affects both astronauts’ instruments and residents back on Earth by throwing off satellites, including GPS systems. For the fastest spacecraft ever, the scientific data the probe collects can’t come fast enough. Due to the spacecraft’s orientation to the sun, scientists must wait several weeks before the data can be transmitted back to Earth.